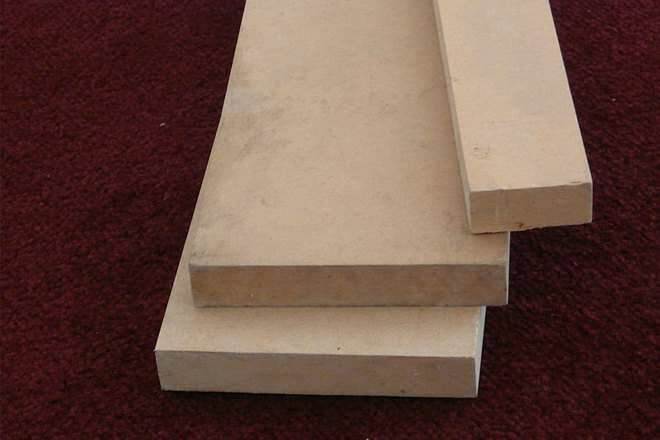 Medium-density fiberboard (MDF) is generally cheaper than plywood, but it is not as hard and can sag under heavy weight. MDF doesn't handle moisture very well, either, so it is more suited for indoor use, such as in furniture. Moisture also affects the strength of plywood; exterior-glued plywood can be used outdoors, but it works best when moisture content remains low. Uniform, smooth and free of knots. Odd number of layers with grains of adjacent layers at right angles to each other. Face veneers are higher grade than the core veneers. 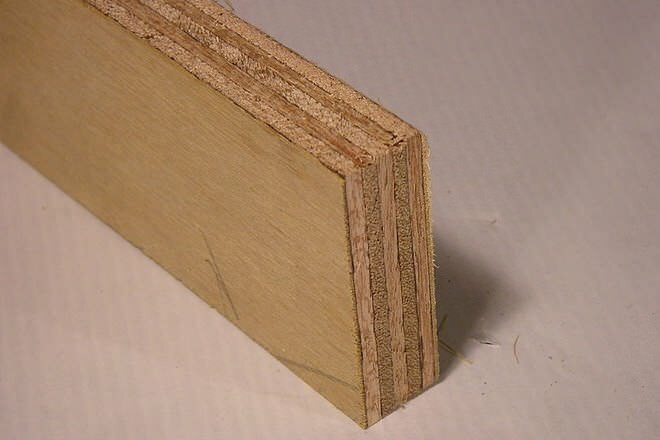 Medium-density fiberboard (MDF) is an engineered wood product formed from wood fibers obtained from breaking down hardwood and softwood with a defibrator. The wood fibers are then glued together using wax and resin adhesive. They are made into panels by applying high temperature and pressure. The resulting smooth wood product has no wood grain and shares many characteristics with particle board. However, MDF is slightly stronger particle board. Plywood is made from peeler logs. Thin layers are peeled from wood logs by rotating them along their horizontal axis. The sheets of veneer obtained from this process are cut to the desired dimensions, dried, patched, glued together, and then baked in a press at 140 °C (284 °F) and 1.9 MPa (280 psi) to form a plywood panel. Depending on the grade of plywood, it may or may not be smooth and useful for visually pleasing interior wood pieces. Some grades of plywood can be stained and made to look good for kitchen cabinetry. Watch the video below to learn more about how plywood, MDF, high-density fiberboard (HDF), blockboard, and particle board differ. MDF is not as hard as plywood and can be damaged easily when roughly handled. It is not as stiff as plywood and can sag with if too much weight is applied to it. 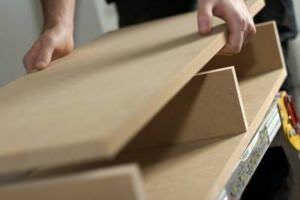 For example, when MDF is used for shelving, it is important to reinforce the shelves to prevent sagging. The cross graining of plywood improves dimensional stability by reducing expansion and shrinkage. This makes a panels' strength consistent in both directions. The odd number of sheets also reduces warping. 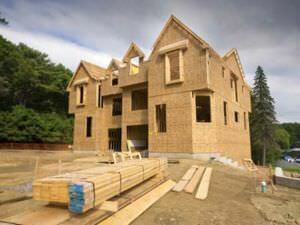 Another advantage of plywood is that extreme cold does not affect its dimensions or strength. When driving a screw at the edge of MDF, the soft core splits easily. When a countersink drill bit is not used, the head of the screw might snap off before sinking in or it might push up chips. In contrast, the cross graining of plywood slightly reduces its tendency to split when nailed at its edges. MDF is commonly used in affordable, lower-end furniture pieces. Due to MDF's non-directional grain structure, it is ideal for cutting, machining, and drilling without producing splinters or chipping. The absence of knots makes it easier for finishing. MDF's smooth surface makes it ideal for simple interior design pieces that will be painted, while plywood adds some durability to those pieces that need to be stronger. Both can be relatively easy for experienced DIYers to use and are found in a number of cheap and affordable furniture products. For example, both MDF and plywood, as well as oriented strand board (OSB), are often in many IKEA furniture pieces. The following video gives tips on how to safely and effectively work with wood panels and which types of saws to use to cut them. Any DIY jobs that require cutting MDF or plywood should take place outside with proper protective equipment. MDF is usually cheaper than plywood, but a lot depends upon the grade of plywood and types of wood used. Higher grades of plywood are more expensive because they are more aesthetically pleasing, often displaying natural hardwood or softwood grains; lower grades are used in construction work where they will not be seen (e.g., for subflooring). Both wood products are also priced according to thickness. A 1/4" Bendy MDF sheet (24" x 48") is about $22 on Amazon, while a Grade B-BB plywood sheet (1/4" thick, 24" x 30") is $10 on Amazon. Plywood being used in house construction. MDF is used for doors and internal paneling in construction, where moisture is less likely to damage it, but was exclusively developed for furniture. As such, it is mainly used for indoor applications. Plywood is used for doors, exterior stairs, external cladding, flooring, framing, interior rails and balustrades, interior stairs, internal paneling, shear walls, timber joinery products, and timber portal frames in construction. Plywood bends easily with the grain, so it is often used to create curved surfaces. For example, the top smooth surface is sometimes used to make curved skateboard ramps. Plywood is more expensive than MDF. It is difficult to create smooth cuts and edges with plywood when compared to MDF. Though plywood is more water resistant than MDF, it is still porous and susceptible to damage when exposed to water over time. Most plywood emits urea-formaldehyde, just as MDF does. However, it is possible to purchase formaldehyde-free plywood. MDF produces a large amount of dust when cut. It should be cut in a ventilated environment, and making use of a respirator is advisable. It is not water resistant. A good, thick primer and paint job can help seal MDF and make it more water resistant, but cleaning up liquid spills as soon as possible will still be wise. MDF is not as stiff and bends or sags under weight. It is not much stronger than particle board. MDF products emit urea-formaldehyde and other volatile organic compounds that pose health risks at sufficient concentrations. Coating them with primers and paints can help decrease their emissions. MDF weighs a ton,and the dust is horrible,you get dirty when you work it.Plywood is a lot lighter,cleaner,and smells better,and holds screws,nails,dowels,better.Plywood would repair better.MDF has it uses but for cabinets i would choose plywood,cost wise it isn`t that much more.